Bulk chrysotile has a hardness similar to a human fingernail and is easily crumbled to fibrous strands composed of smaller bundles of fibrils. Naturally-occurring fiber bundles range in length from several millimeters to more than ten centimeters, although industrially-processed chrysotile usually has shorter fiber bundles. 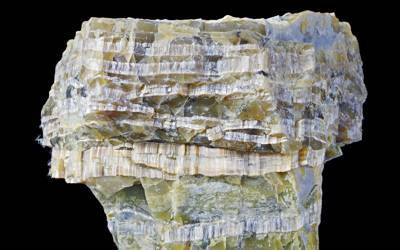 It is a soft, fibrous silicate mineral in the serpentine subgroup of phyllosilicates; as such, it is distinct from other asbestiform minerals in the amphibole group. Its idealized chemical formula is Mg3(Si2O5)(OH)4. The material has physical properties which make it desirable for inclusion in building materials but poses serious health risks when dispersed into the air and inhaled. 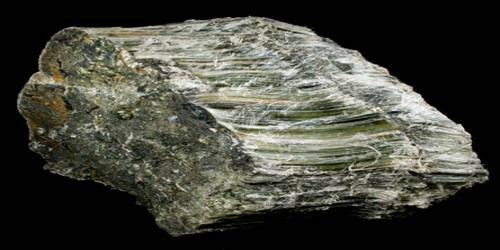 The chief occurrence is in altered peridotite as veins with a lizardite matrix; the world’s greatest deposits of this type are in Quebec and in the Ural Mountains of Russia. Most often the fibers are oriented across the vein and are less than 1.3 cm (0.5 inches) long, but sometimes they are more than 15 cm long and can be found oriented along the vein.